Ancient Rome had its Colosseum; Constantinople, its Hippodrome; and fittingly, Moscow, which by the 1950s had for five centuries been known as the “Third Rome,” had its Luzhniki. Just as citizens of those earlier centers of civilization saw in their arenas a venue at the very heart of society, a place in which they could meet their emperors, the citizens of 1950s Moscow saw football matches at the Lenin Stadium as their chance to see, and often show their outright opposition to, the Soviet Union’s elite. Both the Roman gladitorial games and the ensuing Spartacist slave revolt of the First Century BCE, an event which the Starostin brothers remembered well when they sat down to name their club in 1935, as well as the Byzantine chariot races and the revolutionary Nika Riot of 532, are spoken of by academics today as undeniable turning points in the history of the Western world. Despite recognizing the achievements of the USSR’s sportsmen on the international stage, the significance of Spartak Moscow and the decades of popular resistance happening right here in the real social heart of the Soviet capital, here in the stands of the stadium named for the Father of Russian Socialism, are too often overlooked. It has been repeated on many occasions that supporting Spartak Moscow was always a small way of saying “no” for the people of the Soviet Union, a collective voice against the bureaucratic partiality and elitism that plagued the Soviet state. The vast amphitheatre named after Vladimir Lenin was inaugurated in 1956, a season in which Nikita Simonyan’s 16 goals captured the imagination of the Soviet People and helped Spartak to their sixth Soviet league championship. It was standard in those days for Spartak to attract crowds of some 60,000 spectators, sometimes even exceeding capacity for matches of the People’s Team with that of the Police, their cross-town rivals Dinamo. In those days, it wasn’t club colors or political banners which hurled insults at the authorities and elites, but rather the derisory chants and songs which would become an inherent part of the Spartak culture. For the most part, enmity towards the establishment, and the commercialization of the People’s game, has remained in Russian stadiums to this day – gone however, for the most part, are the spectators. The Luzhniki has consistently been one of the most populated arenas in the country, but even then a vast number of its 80,000 seats lie empty. Last year, I received news of Luzhniki Stadium’s planned refurbishment, a project which would make room for a modern arena suitable to host the first World Cup to be held on Russian soil in 2018. 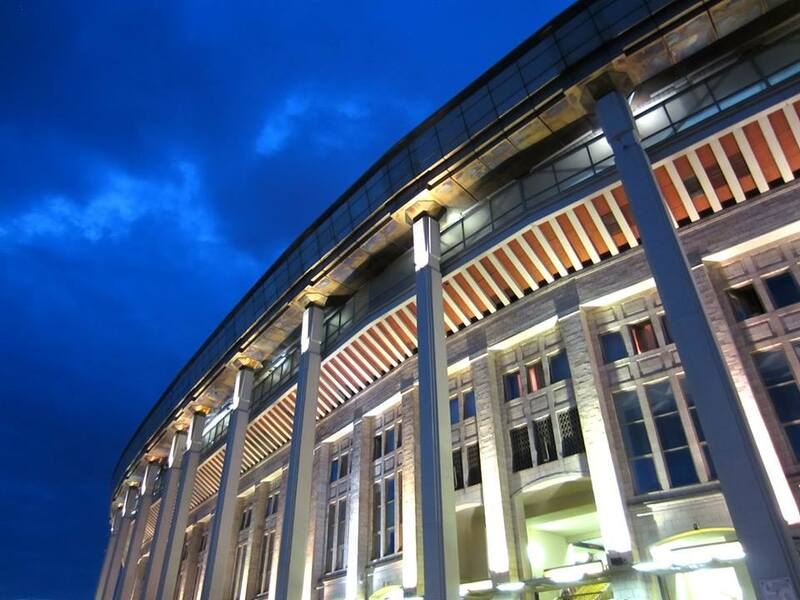 In Russia, such “refurbishment” plans are almost always tantamount to demolition, and as an ardent supporter of this proud football club and its traditions, firmly believing in its place in the narrative of Russian history, this meant only one thing: that I would have to be inside the hallowed theater of sport on its final day. Vacationing in Kazan when the fixtures for the 2012-2013 Russian Premier League season were released in June 2012, I was considering the prospect of finally attending a match of my beloved team. My eyes focused directly on the month of May, the final week of the season and a home fixture with Alania Vladikavkaz. However it was the Week 28 meeting with Krylia Sovetov, as I would later find out, which was scheduled to be the last football match ever at Luzhniki. Several weeks and some seventy-thousand Rubles later, on the first day of May, I was packing my WWII-era veshmeshok, now emblazoned with the silhouette of that famous Thracian Spartacus, the brave revolutionary and hero of Socialist labor, in the words of legendary Spartak captain Igor Netto, with everything needed for the occasion. The most important of all my belongings was stuffed right at the top of my bag: a modern interpretation by one of the world’s sportswear giants of the famous red Spartak shirt with its, historically accurate, 8.5 cm white stripe, and the essential piece to every, proper football supporter’s garb, the red-and-white striped roza, as the football scarf has traditionally been called in Russia since at least the 1970s. Almost a year on, exiting the rickety, green subway car and passing through the cast iron-trimmed marble hallways, we climbed the concrete steps from the vast underworld that is Moscow’s Metro, and were greeted along Ulitsa Tverskaya early in the afternoon on the 9th of May by a Mayakovsky-esque heat. The outstretched thoroughfare flooded by haze, with its hundred-and-forty suns all rolled into one. Pushing our way through the throngs of people gathered to watch the annual Victory Day parade, we threw our bags over sweaty shoulders and trudged down the hill, back in time, into 1930s Presnya. It is in this same Krasnaya Presnya, as is told by all Krasno-Beliy narratives, that the legend of Spartak Moscow began. First stop: the local eatery famous for the Crimean Tatar national dish, Cheburek. Re-energized by this traditional, pan-fried specialty and refreshed by a generous amount of Zhiguli beer, we hit the steamy Moscow streets, much, much too hot for this time of year. It was the eve of the last night at Luzhniki, and despite the unseasonable heat, at that moment in time, in that city in the world, I didn’t want to be anywhere else. I couldn’t sleep the night before the big meeting with Krylia Sovetov, maybe due to the jet-lag, or maybe because I had fallen asleep early in the evening. I had even missed the 9th of May fireworks in Red Square. As the visitors were a club that was originally the team of the Soviet air force, it seemed a fitting opponent for the final match of the great Spartak at Luzhniki, a sort of rekindling of Soviet-era rivalry which still typically characterizes meetings with the likes of Dinamo and CSKA. Besides the vintage feel to this match, it was of personal significance, Samara being the oldest native land of my father’s family, and the birthplace of the footballing career of the legendary Tatar Spartakovets, Galimzhan Khusainov. 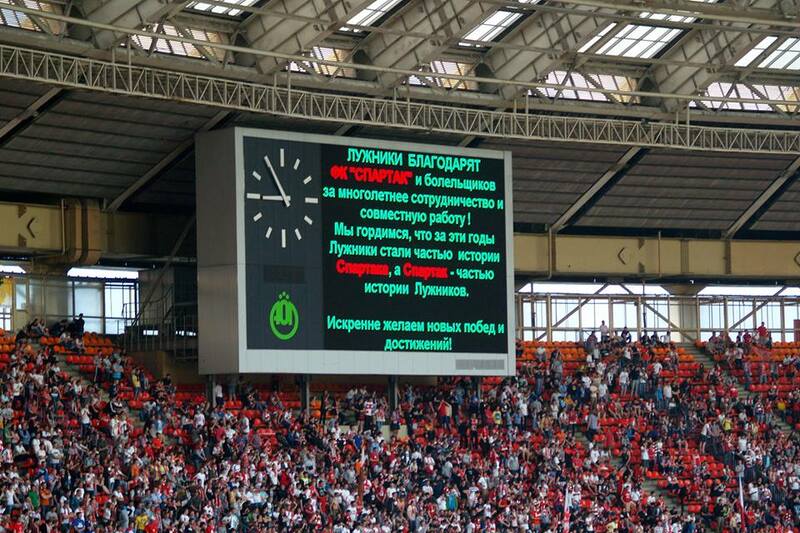 In fact, what was at stake on the 10th of May wasn’t just our position in the league, but the reputation of the modern Spartak Moscow side in the eyes of its former legionnaires. On Friday morning the sun rose early along Ulitsa Tverskaya, and I rose early with it. Some 35 km north of the center, in Tarasovka, Spartak’s future legends were preparing for their pre-match training. 7 km to the south, in Khamovniki, the Spartak ultras were working on the finishing touches to the banners they’d carry into battle that evening. I was busy making my way across the city, underneath the city’s streets, to Sokolniki. Within a few hours, I was proudly wearing my Spartak shirt, now bearing the name and number of the same “little giant,” as Starostin had once called him, Khusainov11. 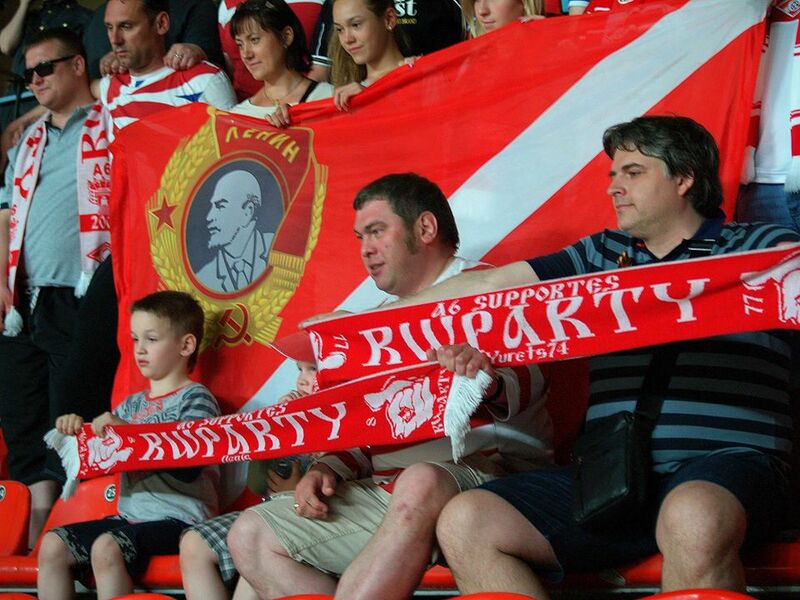 No one, I am sure, will ever accuse Spartak supporters of forgetting their fabled past. Kick-off was set for 20:00. We climbed the hill to Tverskaya around 18:15, and boarded the Zamoskvoretskaya Line. Transferring after a single stop to the Sokolnicheskaya, it only takes about twenty minutes or so to reach Sportivnaya Terminal. By this time, the air in the metro smelled so richly of alcohol that it probably could have been put on tap itself. Along the way, we got the attention of one curious woman, a bit intoxicated and, evidently, a football fan. When we told her that we’d traveled 7500 km to watch the last match in Luzhniki, she only smilingly replied, “Respect.” Most cars on all the arriving trains were, by that time, awash with red and white, and we followed a group of men up the escalator, singing, “Krasno-Beliy navsegda!” (“Forever red and white!”) Stepping out into the evening light, it was the last time we’d ever make this fabled, one-kilometer walk. Back on the Moscow street, we became one with the mass of red and white – families of four and five, lively young couples, mildly intoxicated middle-aged men, fathers with their sons, and proud pensioners, many of whom had been given free tickets by the club. Vendors lined both sides of the way, selling all kinds of red and white memorabilia, and we purchased a match program for the historic night, as well as a scarf commemorating all the team’s championships, both Soviet and Russian. I snapped one last photo before entering through the arena’s iron gates, that of Lenin, resolute forever, in the dying daylight. Just as it has always been between the months of March and November, the end of the week again brings energy, brings life, as the floodlights come on, and a country’s eyes turn again toward Moscow. The stadium wasn’t full, but never needed to be – the atmosphere created by some 20,000 Spartak supporters could rival the likes of 50,000 in any other city. The Soviet football anthem began for the final time, as 22 footballers took the pitch. 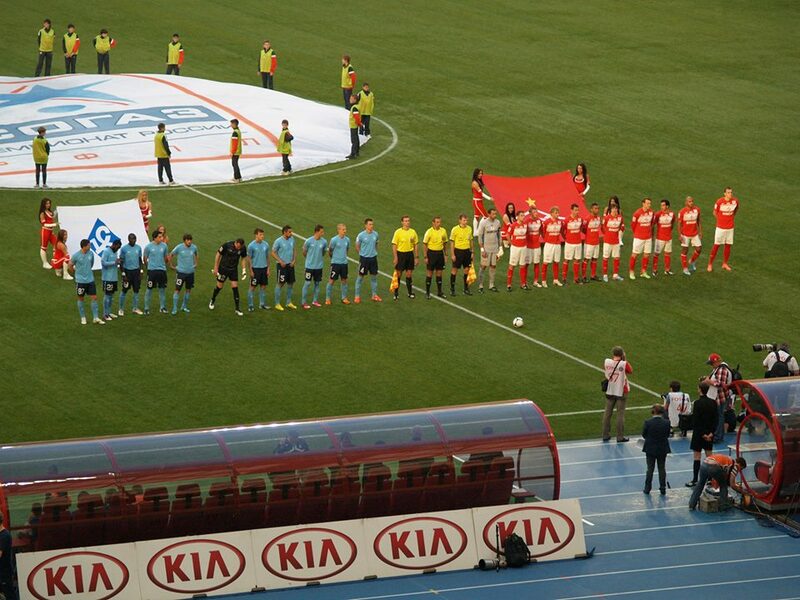 Spartak, in their traditional red shirts with white shorts, sang the Russian anthem with their rivals from Samara, dressed in their own traditional sky blue, with the referee blowing his whistle to start play. Although the football left much to the imagination, two goals did come in the first half. Spartak defender Marek Suchy wrote his name in the history books by scoring the last goal ever at the Luzhniki. At the interval, it was time to sing the Spartak anthem, whilst thousands of red and white scarves were lifted to the evening sky in unison, creating a scene of solidarity under the floodlights not easily forgotten. The final result of the match, as was much of the season which had come before, was a disappointment. Sure, there were many, many scoring chances, there were the obligatory flares characteristic of Russian football, and there was the customary stadium slang being hurled all evening long, but it is enough to say that sitting in the place so revered by Russian sport, so haunted by the ghosts who still play there, fulfilled a long-held wish of mine. 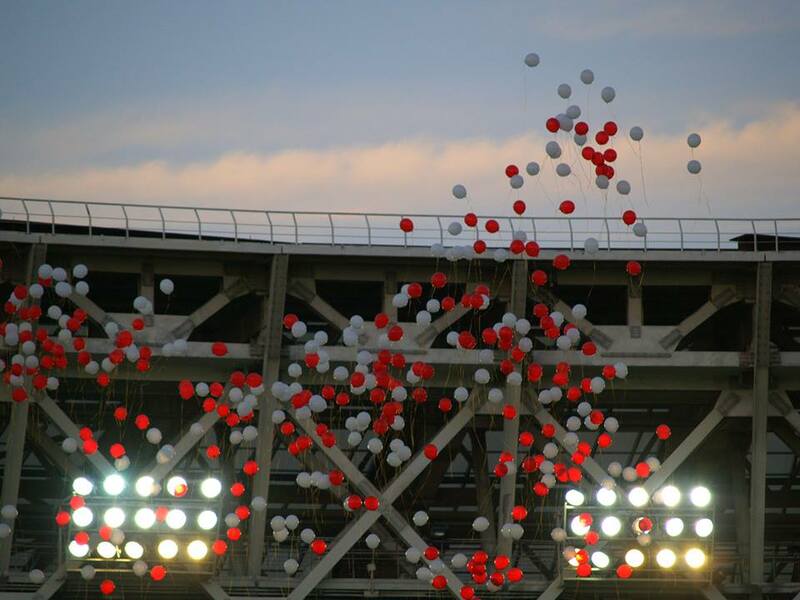 Being a part of that final 90 minutes in the stadium which had long since become a part of Spartak’s history, every one of us inside the Luzhniki that evening thus became a part of Spartak history as well. Two weeks later, Spartak would secure a place in Europe, but just as the campaign opened with new faces and many questions; it had ended with slightly older faces and many more questions. 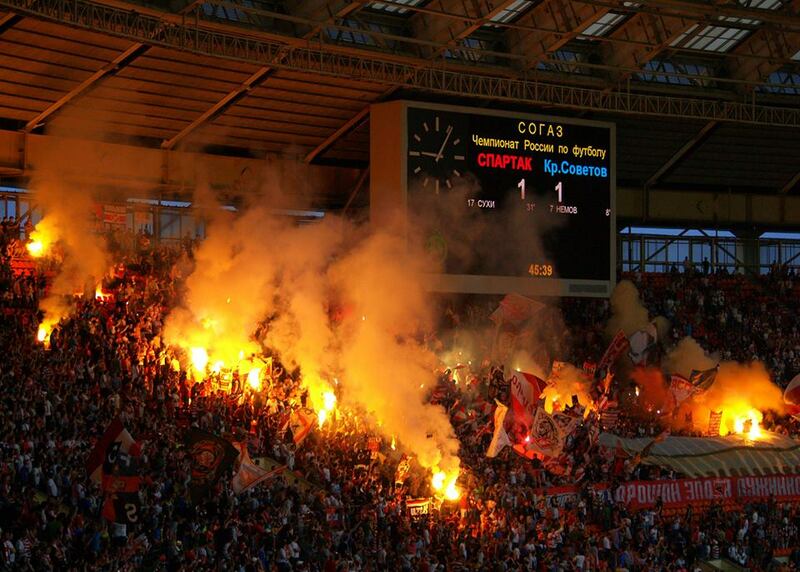 As it was in the past with Torpedo and CSKA, this year Spartak will again shack up with one of their city rivals. This time Lokomotiv, who own their stadium in Cherkizovo, will play host, as Spartak awaits the final touches to its very own home in Tushino, just north of the city. There, a 42,000 red and white arena is being constructed for the future generations of Spartakovtsi. The Luzhniki is slated to host the World Athletics Championship in August, thus providing a final chapter to its storied past before it undergoes the transformation into the centerpiece of Russia’s World Cup. In the final scene of Wolfgang Becker’s 2003 cinematic masterpiece, Good Bye Lenin!, the mother of the film’s main character watches as the upper half of a bronze statue dedicated to the Father of the Soviet state is hauled away. Flying through the air, he turns to face her, his right hand outstretched, as Lenin says goodbye to the citizens of Socialism in Europe, and the People say their goodbyes to Lenin. In front of the Luzhniki Stadium today stands a monument to the same revolutionary. In shirt, trousers, and tie, with his overcoat draped on his shoulders, he faces southeast, to the curve in the river Moskva, the curve which gives its name to this very spot. In Russia, where coming to terms with the past has always proved difficult, the tearing down of the Lenins has also proved to be more difficult than in the Soviet periphery. Soon, it will be the Luzhniki Lenin, the guardian of Spartak’s home for some five intermittent decades, which will also fly away, into the eternal blue. With it, Spartak’s past, and the histories they wrote here in Lenin Stadium, will also pass on. It is a fitting reminder to the football fan, that while the world which surrounds us must constantly change; in all its politics, its heroes, and its forms, one’s loyalty to his beloved club remains constant. Thus, remembering our history, we push ahead. The famous red and white Spartak rhomb which has remained constant since first being sketched in 1935 could very well be the symbolic silhouette of the People’s heart in the same colors. The story of Spartak Moscow is, in many ways, the story of the Soviet Union, of Moscow, and of Russia itself. The club still succeeds and fails, expands and contracts, and unites and divides, as it has always done. As the floodlights go out over the pitch of Lenin Stadium for the final time, the darkness that is Moscow Night reassures us, as the statue of Lenin always did before, that tomorrow is a new day for Moscow, for Russia, and for one legendary football club, Moskovskiy Spartak. Yusha Kozaki is a graduate of both Pennsylvania State University and Fatih University and has lived in Kazan, Tatarstan. A speaker of Tatar, Yusha is an avid follower of Spartak Moscow, and has been known to get up at all hours of the night (and early morning) to overcome the eight-hour time difference to follow his favourite team. Jano Ananidze – Rostov Revival or Demise on Don? Kakha Kaladze – Defender or Pretender? As Edelman has pointed out, however, the Luzhniki was never really the real home of Spartak either. The team has its foundation in Presnya. There the club even had its own stadium in the 20s and 30s. Many Spartak fans from what I know never considered the Luzhniki Spartak’s home ground. 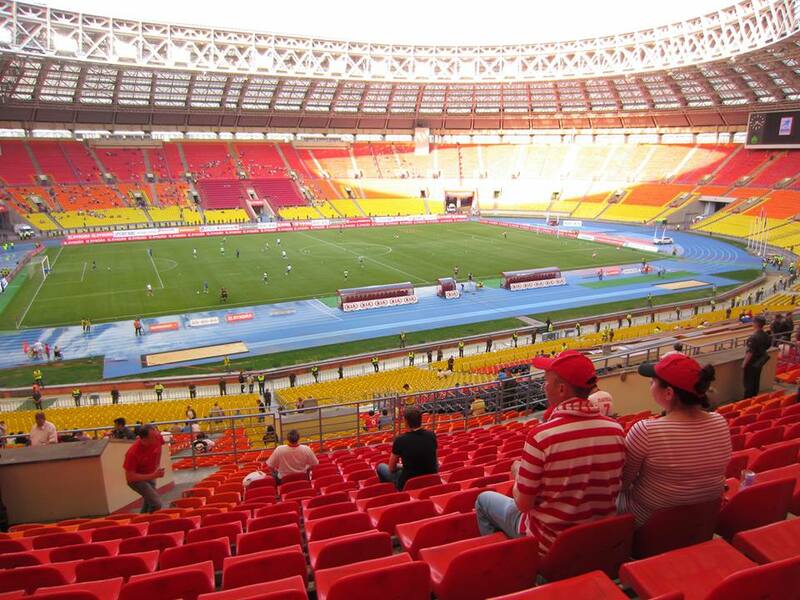 At the same time that is precisely what the Luzhniki has become over the years. It will be fascinating to see what the new stadium will do in terms of attendance and promotion. For once I see a problem with the fact that Spartak will be taken out of the heart of Moscow. For me Spartak was always the Moscow club, a team that didn’t needed a home stadium because the city was its home. Thanks for the article. I was lucky enough to be there, too, and had a wonderful time taking in the atmosphere. I watched my first Russian football match at Luzhniki – Spartak-Kuban in August 2007 – and it will always represent the heart of Russian football for me. By the way, I’m holding out hope that the exterior facade of the stadium will be preserved. From the outside, it’s the most magnificent stadium I’ve ever seen.